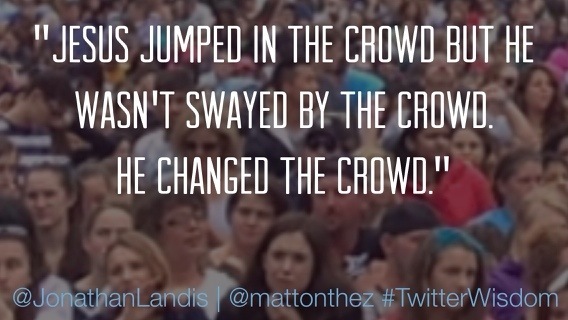 God wants us to change our crowd, to be influencers where we are! David Mathis astutely points out that we often get this backwards. The “in the world, but not of it” mantra you often hear in Christian circles, implies that being in the world is our starting place. But if you read John 17, you see Jesus first says that we are NOT of this world. As followers of Christ, that’s where we start. We are visitors in this world. Aliens. We are just passing through. Have you ever sent someone to the store without a purpose? Have you ever sent someone a letter with no message? The word sent indicates purpose. Let’s live on mission, with purpose and rather than be changed by the crowd, let’s remember we’ve been sent to make a difference!